To Make Crocant Paste Take one pd of flour, and 3 ounces of Loaf-sugar beaten, make a hole in the middle, put in one spoonful of rose water, and as many yolks of eggs as will make it into a stiff paste; put it in a mortar, and beat it half an hour; then roll it out thin, butter your crocant pans, and lay it on cut it in diamonds, or flowers or in what form you please; bake it in a slow oven, and serve it up over sweet-meats. 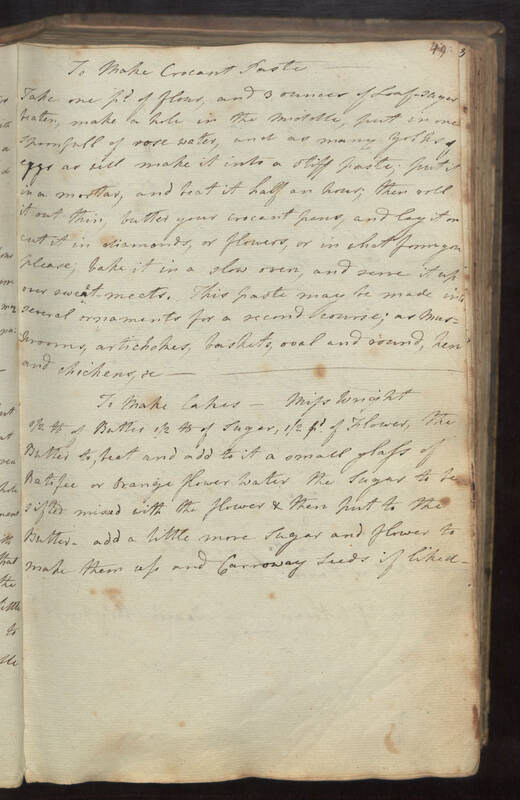 This paste may be made into several ornaments for a second course; as mushrooms, groom, artichokes, baskets, oval and round, hen and chickens, &c - To Make Cakes - Miss Wright 1/2 lb of Butter 1/2 lb of sugar 1/2 pd of Flower, the Butter to, beat and add to it a small glass of Ratifee or orange flower Water the sugar to be sifted mixed with the flower & then put to the Butter. add a little more sugar and flower to make them up and Carroway seeds if liked.